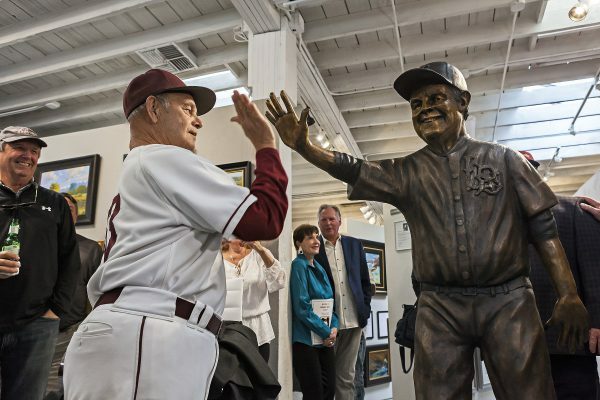 After years of planning a tribute to the Laguna icon, a life-size statue of Carrillo was finally unveiled at a homecoming ceremony on Sunday, Jan. 20, at Forest & Ocean Gallery. Eighty-year-old Carrillo is credited with coining the phrase, “Have a home run day!,” and he shares that mantra with a wave of his arm with everyone he meets. In addition to sharing his upbeat mantra, Carrillo can be seen around town wearing a different baseball uniform daily, attending youth athletic events, and filling conversations with baseball trivia and terminology. He volunteered for more than 30 years for Laguna Beach High School baseball and football teams, and he’s the namesake of the school’s baseball field. He even gives his friends and family famous baseball player nicknames. Sculptor Randy Morgan—nicknamed Joe Morgan—said he first met Carrillo in the 70s when he noticed him walking past his house at Lombardi Lane and Anita Street. Carrillo would walk from the high school in a baseball uniform, and eventually the two got to talking and became friends. After Morgan decided to pursue creating a statue, he had some photographs taken of Carrillo in 2013. Another “teammate” of Carrillo’s is Forest & Ocean Gallery owner Ludo Leideritz—nicknamed Gil Hodges. After about three years of talking, planning and fundraising with Morgan and Rowe, Leideritz said it was amazing to see about 150 community members gather at the gallery last Sunday to celebrate Carrillo and the new bronze monument representing his legacy in town. “It was beyond our expectation,” Leideritz said. “Everyone was so pumped up and energetic, there was just a lot of love going around. I saw nothing but smiles, nothing but cheers—all the good things that we like to think about a community having for one of its key citizens. And he certainly is that. Leideritz said the statue finally became a reality over the last few months, following a major fundraising event hosted by Roux Creole Cuisine owner Michael Byrne this past November. The fundraiser not only reinvigorated the movement—it raised the money needed to complete the long-awaited life-size statue. Morgan said community members are also helping to find the statue a home. Dr. Mark Judy and his sister, Diane Rigler, have donated a portion of their property for the statue’s placement at the corner of Park and Glenneyre. That site is still a work in progress, Leideritz noted, as the sculpture will still have to go through city reviews. Morgan feels it would be a great location for the statue, as it’s along the route Carrillo would take to walk downtown from the high school and his house. He said the goal is to have the statue installed by the opening day of baseball at the high school. Additional contributions are still needed for the installation of the statue, as well as for maintenance. Call 949-494-0703 for more information. Checks can be made to the Skipper Carrillo Statue Fund and sent to 450 S. Coast Highway, Laguna Beach, CA, 92651. In addition to the statue honoring Carrillo’s legacy, a feature film is being developed by a separate team of locals looking to draw attention to Carrillo and the story of a local underdog soccer team. Based on true events, “Titch,” which is currently in pre-production, chronicles Carrillo’s relationship with the 1997 Laguna Beach High School championship-winning soccer team. Screenwriter Andy Thomas, who coached the team in ’97, said Carrillo would often attend the games and cheer the young athletes on. Thomas, who hails from the Isle of Man, currently coaches a soccer club in Laguna and said he’s been working on the script for the last couple of years. Producers Jason Tamasco and Zak Kristofek recently attached themselves to the project, along with director Nick Egan. Executive Producer Jason Griffin Reidel, who co-owns Gorjana Jewelry with his wife in Laguna, signed onto the project last fall after hearing about the script. Reidel said he’s excited to include Carrillo’s story in the film. Production is being slated for later this year, with anticipated release in mid-2020. The producers have pledged that a percentage of profits will be donated to the Skipper Carrillo Scholarship Fund, which provides assistance to LBHS seniors who have overcome adversity.